The next wellness beauty I spoke to was Lucy Macdonald, the gorgeous girl behind the food gram @feeling.foodie . Along with a couple of the other girls I have spoken to, Lucy's gram was one of the first foodie grams I followed and I was so inspired by all her yummy posts that I created my own! Lucy is super passionate about living a healthy lifestyle, she is a lover of food, exercise and all things pretty, healthy and nourishing! If you ever need advice on where to eat in Auckland, she's your gal! Enjoy reading through this lovelies!! Hello! My name is Lucy, I am 20 years old and live in Auckland. I am in my third year studying Law and Science at the University of Auckland. I am (clearly) a very passionate foodie and love all things food, health and beauty related! When I’m not studying you will find me foodie-ing, spending time with my boyfriend (usually eating) or walking my little pup – Kobe. My health is SO important to me, it really sets the scene for how I feel in all aspects of life! When I am feeling on track in terms of exercising and eating healthily I really notice a difference in how I feel, how I study and how I sleep. However, in saying that I realize that balance is key to a healthy lifestyle. So I really aim to make sure that I never forget that. It is so easy to get caught up in these unrealistic lifestyles that we see on social media that comprise protein shakes, tuna, brown rice, and salad. That is definitely not my idea of a healthy lifestyle. Balance is key. · 6:45am – Wake up. Get ready for Uni. · 8am - Arrive at Uni. I am at Uni every week day from about 8 -4pm. By 4 my brain needs a break (everything has turned to mush) and so I choose to do my exercise then! · 4pm– Time for my exercise. Depending on how I am feeling, whether I am super tired, needing some fresh air etc, I will either hit LesMills GRIT (I prefer GRIT Strength), go for an hour power walk, do HIIT intervals on the treadmill, or a CX worx class. · 6pm – Dinner time! I don’t really stick to a strict routine but I will usually have porridge, a protein smoothie or, if I’m eating out then I will have eggs and avo for brekkie!! I am a firm believer in a good brekkie to set you up for the day (not a fan of that skipping breakfast business). For lunch, sometimes I am super hungry and will have a big salad + freshly squeezed juice, or brown rice sushi. But often I like just having snacks throughout the day such as nuts and froozeballs as I study! For dinner my Mum buys a lot of salads and meals from Ripe Deli in Grey Lynn for me! I will often have a piece of salmon or chicken breast and a mixture of wholefood salads such as barley, bulgar wheat and veges etc. In Winter I also love some classic pumpkin soup. Oh and I will ALWAYS have something sweet after dinner…I don’t know what it is, I do it even when I’m not hungry – sometimes it’s just a piece of 85% cocoa Lindt chocolate, or sometimes it’s frozen berries, yoghurt and nuts! And always a cup of green tea. Yum. But, I usually always go out for dinner on Friday and Saturday and out for brunch in the weekend (my treat after a long week of study). For me, purely how I feel when I am living a healthy and balanced lifestyle is enough to keep me wanting to maintain it. Being healthy makes me feel less sluggish, more motivated and more confident in my own skin. Every now and then when I have a super unhealthy weekend, or a few days off the gym I really realize how important a healthy lifestyle is to me. I used to be REALLY bad at dealing with stress and pressure. In my first year at uni I often couldn’t sleep, couldn’t get myself to leave my desk because I was too stressed I would miss out on valuable study time, but since then I have made some big changes in my mindset which have been so beneficial. I now MAKE SURE that whenever I am feeling stressed or under pressure I take a break and go for a walk, go to the gym or just go out for coffee with my mum. It is the best thing you can do. You realise that the world is still spinning outside. Whenever I am feeling stressed and under pressure, I take a step back and think about what I am doing and most of the time, I have done everything I possibly could have to prepare, or have given something my absolute all and that is all you can do! My main motto through and through is you can only do your best, nothing more. Oh and also, that everything will work out in the end! It always does. I have had a few injuries in the past which have put me out of exercise for a period of time and that has been really difficult for me, especially in times of stress and pressure where I really need exercise as an outlet. That has been a real struggle for me in the past and has impacted me in more ways than just physical. Do everything you do for YOU, don’t do things to please others because you won’t end up pleasing yourself. Sometimes you just need to put yourself first and make yourself proud, it is so rewarding. Hmmmm don’t think anyone told me that, is advice from me to myself (sorry!). I LOVE cheese (haha but seriously, I make an awesome platter ;) and always want to eat all of the cheese. It’s just so good!) Otherwise dark chocolate, or Milse Strawberry gelato on a stick!! 1. Not food – but COFFEE. Neeeeed 2 a day please. 2. Bliss balls! All shapes and sizes. They are my study go to! GRIT Strength – I don’t fit it into my schedule enough when I’m busy with uni but it is definitely my favourite! Gets a super good sweat going and makes you feel strong. Sometimes, I just crave going for a run though – it is so therapeutic (that hasn’t been very often recently though…lol). No words of wisdom really, just be true to yourself, put your health first (it is such a priority and will impact you in more ways than you realize) but don’t forget BALANCE. Have fun, eat the choccy and chips and don’t let fear of what you’re eating overwhelm you. 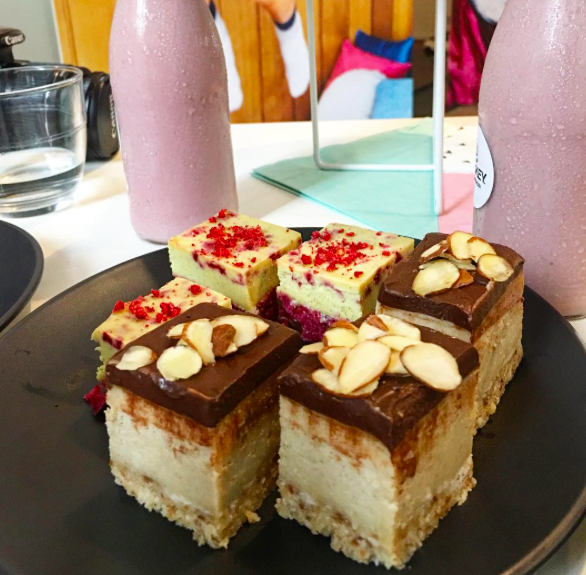 Thanks to the lovely Lucy for being apart of this, you'll find her on insta @feeling.foodiewith some delish breakie posts! Go check her out!